Stop comparing yourself to other people. You are unique, trying to fit in and adjust to society would be a waste of your energy and a wrong path taken in one. Believe in your ability to succeed in whatever you put your mind to and remind yourself every day that being different is being real. Remember, the way you see yourself is how the world sees you, so do not waste time with trying to be someone you are not, rather believe who you are and be the best you you can be. 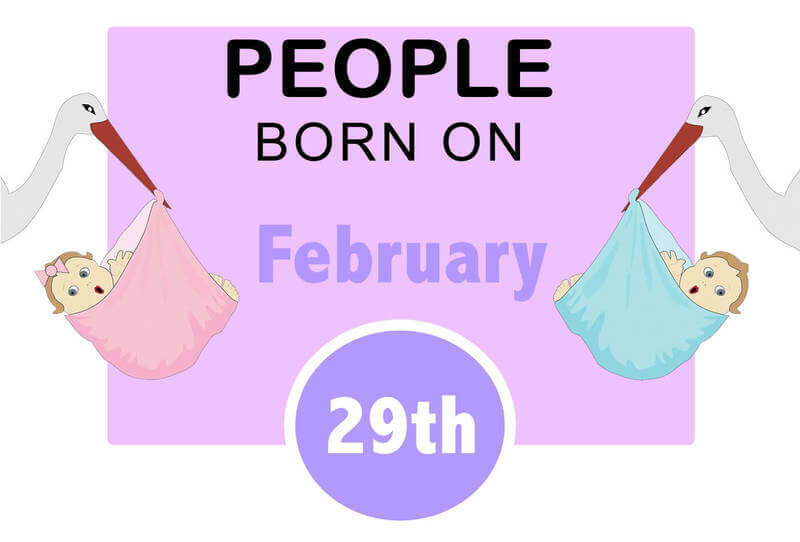 You are not unique only from the character point of view, you are also a rate gem that celebrates real birthday once every four years. Unusual course of life right? Well no. Because it also gives you that different vibe of the nature, which makes you a very likeable person, and you have that diplomatic way about you. Your biggest lessons in life are learned early on in life. Perhaps your own way of looking at things being different to outside world for how you think about your birth date. You know, what you think you project, and projections are somewhat hardest and most beneficial lessons learned. Your social skills are quite perfected, in a way to the point people can not even see the mask front you wear, as you make everything in your life seem like it is achieved with exceptional ease, even the great resilience to life you possess is well hidden underneath the appearance of dreamer. But underneath the relaxed appearance there is a tough and ambitious person who chases after their goals. You have always worked harder, approached opportunities more aggressively, formed strategies, all a result of your own perception of self. In a way a self-destructive game you play with self, but on the other hand, it is a very ambitious and assertive way of chasing after success, proving self you can go beyond your limits. Whichever way you want to look at it though, make sure you understand that trying to prove to world what your capacities are can result in alienation more rather than impress people. You most likely have a great insight into people’s vulnerable points as well as strong points. Where on the other hand people have a very hard time understanding same for you, including your motivations. Your observance is motivated by your desire to feel needed, to fit in, to be no different from others. You are very sensitive to other people’s problems and you are very caring and nurturing. Your desire to help people going through hard times sincerely reflects on the outside. The only downside to it is that you somewhat automatically expect the gratitude. And if you do not get it you tend to have a quite immature response to it. Avoid emotional extremities and rather pay attention to your intuition, as your different view of the world is your strength rather than weakness and your uniqueness is highly valued in society if yourself to be what is. You desperately want a loyal relationship, someone who will be there for you and do everything for you, but you know being insecure can really backfire in relationships and the neediness can result in feeling suffocated. Learn to be more secure and independent and form a life outside your relationship as well, allow some much needed space to flow in relationship and that will make it last longer. Steer clear of unnecessary risks and indulgences, you are mature beyond your years, try and keep your head wrapped around that thought. Stick to your youthful choices of sports to keep yourself in good shape, and for those of you who love cooking make sure you stick to healthy foods and avoid overindulging yourself in rich food. Keep your mind calm. Your competitive spirit, sharp instincts and the need to prove yourself may best be expressed in careers in sports, business, art, music, writing or even politics.